Apply to wet hair, massage gently, rinse and repeat. Follow with LOVE/curl conditioner or hair mask. The scent that characterizes the LOVE family has a citrus and green note. No exceptions. We do not share any of your information. Apply to wet hair. Massage gently and rinse. Repeat shampoo application, then apply the love smooth conditioner. Phenethyl Benzoate - strong shining effect. Ideal for frizzy or unruly hair for a smooth look. Davines Love Smoothing Shampoo 250ml 8.45oz. Davines Essential Haircare Award Winning Smoothing Shampoo is ideal for frizzy or unruly hair for a smooth look. Its formula, characterized by a soft and creamy foam, is designed to gently cleanse frizzy hair and favor styling, making the hair smooth. Davines Essential Haircare Award Winning Smoothing Shampoo is ideal for frizzy or unruly hair for a smooth look. Its formula, characterized by a soft and creamy foam, is designed to gently cleanse frizzy hair and favor styling, making the hair smooth. Or I have received them in a subscription box. and colors may not appear exactly like they do when you receive the item in person. Davines Love Curl Shampoo and Conditioner Duo set 250 mL / 8.45 Oz each. Lovely curl enhancing taming shampoo and conditioner for wavy or curly hair. Trending at $36.97eBay determines this price through a machine learned model of the product's sale prices within the last 90 days. Davines Love Curl Shampoo. Davines Love Curl Conditioner. Apply to towel-dried hair after using LOVE/curl shampoo. Leave on for 2-5 minutes, comb, then rinse. Proceed with drying. Apply to wet hair, massage gently, rinse and repeat. Excellent for harsh and frizzy hair. Lovely smoothing shampoo with Indian fig extract. Give Beautyvice a try, you will not be disappointed. Helpful Links. Davines Love Smoothing Shampoo and Conditioner Duo set 250 mL / 8.45 Oz each. For frizzy or unruly hair. Creamy, soft, foamy love shampoo with all of extract gently cleanses and moisturizes wealth early smoothing hair. Love conditioner smooths frizz, hydrates and helps restore elasticity with olive extract from Messina, Italy. Trending at $43.00eBay determines this price through a machine learned model of the product's sale prices within the last 90 days. Davines Love Lovely Curl Enhancing Shampoo (Original Formula)16.9 oz. Give Beautyvice a try, you will not be disappointed. Helpful Links. PRODUCT TYPE- SHAMPOO. MODEL- LOVE. 100% AUTHENTICITY GAURUNTEED . Give Beautyvice a try, you will not be disappointed. N ew D avines Love Shampoo 8.45oz. Love curl shampoo uses almond extract to hydrate textured hair. Enhancing shine and manageability. Davines Love Smoothing Shampoo (Original Pink Formula) 16.9 oz. Davines Love Smoothing Shampoo 16.9 oz. Give Beautyvice a try, you will not be disappointed. Helpful Links. Davines LOVE Shampoo 250ml / 8.45oz. DAVINES LOVE SMOOTHING SHAMPOO & CONDITIONER. DAVINES LOVE CONDITIONER 250ml / 8.45oz. For frizzy or unruly hair. Winner of Allure's 2011 and 2014 Best of Beauty Awards & The Coveteur's Luxury Beauty Awards: Best In Hair. Smells so good and leaves your hair so smooth and soft I'm switching shampoo and conditioner since my hair is damaged from bleaching. Thee is about 50ml of product on both shampoo and conditioner. I would refill the smaller davines containers that I have with these. Let me know if you have any questions. It gently cleanses hair, respecting its natural structure and making it easy to comb. What else you need to know. Trending at $52.96eBay determines this price through a machine learned model of the product's sale prices within the last 90 days. Davines Love Smoothing Shampoo & Conditioner Duo 8.45 oz. Ideal for frizzy or unruly hair for a smooth look. Its formula, characterized by a soft and creamy foam, is designed to gently cleanse frizzy hair and favour styling, making the hair smooth. Davines Love Curl Shampoo 2.5oz Conditioner & Hair Mask Packets Deluxe Travel. Condition is New. Shipped with USPS First Class Package. This product leaves curls soft, well defined and tangle-free, with its blend of essential extracts and special conditioning agents to discipline and volumize curly and wavy hair. -PURPLE- DAVINES LOVE SMOOTHING SHAMPOO 33.8oz / 1000ml with PUMP SHIPS FAST! Davines LOVE Shampoo 1000ml / 33.8oz. DAVINES LOVE SMOOTHING SHAMPOO W/ PUMP. For frizzy or unruly hair. Winner of Allure's 2011 and 2014 Best of Beauty Awards & The Coveteur's Luxury Beauty Awards: Best In Hair. 5 out of 5 stars - -PURPLE- DAVINES LOVE SMOOTHING SHAMPOO 33.8oz / 1000ml with PUMP SHIPS FAST! 10 product ratings10 product ratings - -PURPLE- DAVINES LOVE SMOOTHING SHAMPOO 33.8oz / 1000ml with PUMP SHIPS FAST! Apply to wet hair, massage gently, rinse and repeat. Follow with LOVE/curl conditioner or hair mask. Ideal for wavy or curly hair. The scent that characterizes the LOVE family has a citrus and green note. Love Smoothing Shampoo by Davines is a unique cleanser that detangles while it cleans. If you have unruly waves, this is your secret weapon. Before you even break out the conditioner, your undisciplined frizz turns smooth and silky. 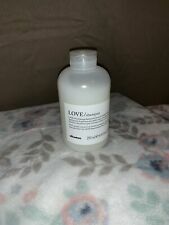 Davines Love Shampoo 250 ml 8.45 fl oz. 4.5 out of 5 stars - Davines Love Shampoo 250 ml 8.45 fl oz. 11 product ratings11 product ratings - Davines Love Shampoo 250 ml 8.45 fl oz. Apply to wet hair, massage gently, rinse and repeat. Follow with LOVE/curl conditioner or hair mask. The scent that characterizes the LOVE family has a citrus and green note. PRODUCT TYPE- CURL SHAMPOO. ITEM INFO- Excellent for wavy and curly hair. Lovely curl enhancing shampoo with almond extract. MODEL- LOVE. 100% AUTHENTICITY GAURUNTEED . Davines LOVE Smoothing Shampoo. Free Beauty Sample With Every Order. 75 ml/2.5 oz ~ Travel Size. We will try our best to work it out with you. Size: Travel size. We are very serious against false claims. Any attempts with intend to manipulate our system will result in appropriate repercussions. Davines Love Smoothing Shampoo 2.5 oz And Love Smoothing Conditioner .40 Floz. Condition is New. Shipped with USPS First Class Package. Excellent customer service is our objective, we will respond quickly to any address any issue regarding your order. If you are not happy with your purchase, we will fix the issue immediately with a replacement or refund. Please note that feedback is important to us, and we will do our best to make you happy. Bad feedback will not resolve any issue, so please communicate with us so we can solve any problem that we can. Shipping: We ship orders the same day as we receive them. Our shipping cutoff for same day shipment is 3:30 PM - Pacific Standard Time. Tracking information for each order is available on the eBay order page and you will receive updates on your order in transit. Returns: We offer a 30 day return for items returned sealed & complete. This product leaves curls soft, well defined and tangle-free, with its blend of essential extracts and special conditioning agents to discipline and volumize curly and wavy hair. The serial number on the unit must match the serial number on the box, warranty card, and the serial number from our own unique ID internal system. Davines Love Smoothing Shampoo, 8.45 Fl. Davines Love Lovely Curl Enhancing Shampoo is an enhancing and smoothing shampoo made specifically for curly and wavy hair. It has an intense untangling and conditioning action which provides hair with manageability and shine. One Davines LOVE Shampoo 2.5 Fl Oz New. 1 - Davines LOVE CURL Shampoo liter. DAVINES LOVE Shampoo Travel/Trial Size 2.5 fl oz FREE SHIPPING! Davines Love Shampoo with Olive Extract 75 ml / 2.5 fl.oz.